(Logan, UT – January 14, 2019) Pantone announced Living Coral as the 2019 Color of the Year, and Altra’s Spring and Fall line is on trend with its new Escalante 2, Dyani, Torin 4, Superior 4 and HIIT XT Mid featuring the warm, vibrant color. Altra’s award-winning Escalante is back with a new Living Coral knit upper on the Altra Escalante 2. A new structured knit with perforations provides better breathability, a more secure fit and enhanced performance while maintaining classic Escalante comfort. A new Dri-Lex® Dri-Freeze heel liner was added for heat control and a better on-foot feel. Flexibility was enhanced by increasing the decoupling in the Altra EGO™ midsole and outsole. The Escalante’s stack stays the same at 24mm and 7.4 ounces for women. MSRP for the Escalante 2 is $130, available July 2019. The Altra Dyani is a women’s-only slip-on with a Living Coral knit upper that’s convenient, comfortable and cute. The Altra EGO™ midsole coupled with a sock-like knit upper gives ultimate comfort with a fashionable flair. The Dyani has a 20mm stack height, weighs just 6.7 ounces and has a trendy athleisure look that pairs well with leggings or jeans. MSRP for the Dyani is $100, available February 2019. The fan-favorite Altra Torin 4 road shoe was revamped for the racecourse and features highlights of Living Coral. Stack height and weight were decreased by removing the strobel layer and adding a new Quantic™ midsole for the perfect blend of plush, responsive cushioning in a lightweight ride. Strategic decoupling on the outsole allows for better flexibility and a smoother ride, while a performance mesh upper keeps the shoe light and speedy. The Torin 4 features a 26 mm stack height and weighs 7.5 ounces for women. MSRP for the Torin 4 is $120, available May 2019. Altra’s Superior 4 includes accents of the popular Living coral color in the women’s burgundy colorway. At 6.6 ounces for women, the Superior 4 is one of the lightest trail shoes on the market. Altra’s new Quantic™ midsole is soft and light to adapt to uneven trails for a more stable ride, while being the perfect blend of plush comfort and responsiveness. A new stickier MaxTrac™ rubber outsole improves grip, traction and durability and easily tackles gnarly terrain. A wraparound upper with minimal seams and a new rounded heel cup provide more stability and a sleeker fit. MSRP for the Superior 4 is $110, available January 2019. 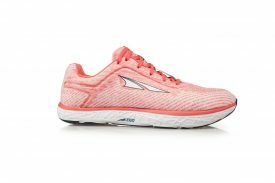 Altra’s HIIT XT Mid is a women’s-only mid top version of the popular HIIT XT gym and court-enabled cross-training shoe, available in white with pops of Living Coral. This shoe is made to function like a cross trainer, but is also stylish enough for everyday wear. The upper is a soft custom knit design, while the midsole and outsole are supportive and durable to tackle weightlifting, gym workouts and court sports. Altra’s Mid version has an innovative removable PowerSole™ insole that drops the stack from 20mm to 15mm, ideal for squats or heavy lifting. MSRP for the HIIT XT Mid is $120, available February 2019. Be sure to look for Altra’s shoes featuring Pantone’s Color of the Year on www.AltraRunning.com and at your local specialty running retailer.